Spring Is Officially Here And So Are The Ants! Spring is in the air and that means one thing! When the warm weather arrives, ants are on the move, as Spring marks the peak months of swarming season. Reports are especially high during their swarming season, April through June. During these months, new colonies are established while fresh food sources are sought out. Ants are one of the most successful groups of insects to inhabit the Earth during the past 100 million years. They are also of particular interest because they are a social insect and form highly organized colonies or nests, sometimes consisting of millions of individuals. Colonies of invasive ant species will sometimes work together and form supercolonies, spanning a very wide area of land. Ant colonies are sometimes described as superorganisms because they appear to operate as a single entity. Watch ants for any length of time, and you’ll witness some remarkable feats of strength. 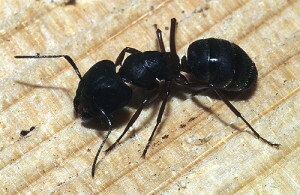 Tiny ants, marching in lines, will haul food, grains of sand, and even small pebbles back to their colonies. It’s true that ants can lift objects 50 times their own body weight. That’s equivalent to a human carrying a car! In many ways, ants can outwit, outlast, and outplay humans. Their complex, cooperative societies enable them to survive and thrive in conditions that would challenge the individual. Ants belong to the insect family Formicidae in the order Hymenoptera, the same order comprising bees and wasps. Ants are also the number one pest problem in the country. They crawl over the rocks by the dock. They pile up sand on the sidewalk. They scurry across the kitchen floor. City or country, outdoors or in, ants are everywhere! Their colonies are enormous, numbering up to 300,000-500,000…lets face it, that is a whole lot of ants. The weather can’t seem to make up its mind lately. Some days it is near 60 degrees and sunny, other days low 30s and snowing. Either way, Spring is finally here and that means that Minnesota homeowners are beginning to see foraging ants in the kitchen or other areas of the home, especially on warmer winter days. So, before things progress any more in the ant world, now is the time to contact the Minnesota pest control expert who will locate the nest location(s) and eliminate all the ant colonies before they completely take over!